What you encountered was "constructional stretch", which is just the braid re-setting itself after being disturbed by the splicing. When using dyneema, this must be taken into account when you do the splicing; in other words, you make it shorter than it needs to be. There are guidelines for the different sizes as to how much they will lengthen as the braid returns to its normal positon after being disturbed. "Creep" is permanent elongation due to constant load. When properly sized, ie, working load 1/3 of the dyneema's breaking strength, you will not experience creep. On a Wharram you will not need to worry about creep due to the design of the standing rigging; the boat's lashing system is so much looser than a rigid wing design, or a system of diamond stays, that the rigging will never experience constant load. I made my first forestay too long and used up the adjustability of my lashing while the 12-strand braid reset itself. I spliced up another forestay out of dynex dux that was much shorter than my first one: I was worried it was too short! It has worked out perfectly. Observing my dyneema shrouds and bridles, I could have made another forestay out of plain dyneema had I made it the same length as the dynex dux forestay. Dynex dux is just dyneema that is "heat-treated" by the manufacturer: it feels as stiff as wire when new. In other words, the fact of constructional stretch was obviously not taken into account. no stretch noticed after first stretch following rigging. In working the stuff, one imparts slack which has to be allowed for in the rigging process, and has to be 'worked out' after the knotting and splicing is complete. Also one can use lock stitching on it, or seizing, using dyneema twine. Those pretty much settle the creep issue. I suspect that this was the first time the rigger had done this and I did not know any better. Fitted new 6mm wire bridle today and got the rig pretty tight so we will stay that way, especially as the dynemma we were supplied did not have a cover and we were worrying about abrasion from the anchor bridle as we plan to be spending a lot of time at anchor. Will set up the dyneema bridle as part of our storm kit and link it with the dyneema lazy forestay via a block and tackle so that will handle the stretch issuem. How much do you allow for constructional stretch? I am going to make the splices for the lazy forestay and have not found an answer to that yet. Near the end, #17, are the guidelines: "You can expect about 2 inches of stretch for 7mm and 4 inches for 9 mm to reset the line braid." As always, get some extra line to practice with, and do some measuring as you go to see how the length changes after the braid resets. I have raced for over 5 years with 3mm dyneema shrouds and forestay on my little 12' Keyhaven Scow dinghy, it has a lug rig and mine also had cabon mast and spars. 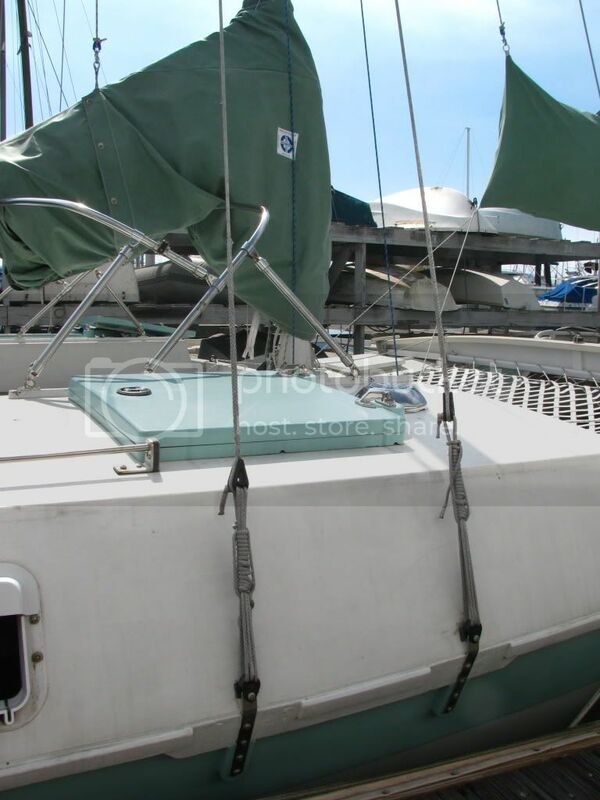 The shrouds were attached permanently and the forestay on a clip so I could raise and drop the mast quickly. The forestay clip was set up to be a good hard pull to clip on so the rig was reasonably tight for sailing. After a strong wind race I would notice that the shrouds were slack, so the dyneema had stretched. So I would move the clip up the forestay and then when I came back to the boat to race a week later, the forestay would be too short to be able to clip on. The dyneema seems to stretch and then recover. So it does stretch and recover repeatably. I understand there are versions of dyneema which dont do this, the type used for 4X4 winch lines I think. That must be best for yacht applications. I can confirm it's far nicer than wire to deal with and great that you can make up your own shrouds. A pal made a very nice backstay for his racing yacht. Let me clarify that the figures above for resetting the braid are for dynex dux, the "heat-treated" dyneema. I would double those figures for plain dyneema. It's a different material than steel wire, so it has different characteristics. I've sailed in good breeze several times since I rigged my tiki 26, tightened it afterwards, and the braid is well-set. One thing I've noticed here in Southern California, and others have mentioned, is the line does cycle when the weather goes between damp/cool to hot/dry. It goes "limp," so to speak, in the cooler weather, and gets tighter when the sun comes out. This does not cause any problems for me. I have a dynex dux forestay, with plain dyneema bridles and shrouds. Thanks for the input, I hope to put it into practise soon. The stretch occured when we were beating for hours into a force 4-6 with short seas so it was a pretty good work out. As I had to tension up the spinnakler halyard to keep the shrouds taught the bridle probably contracted before we got round to tightening it. The weight saving is impressive. We will need new shrouds soon and I would like to use it, but only if I can set up dead eyes at deck level so that I can take up the slack whilst sailing. David, here's a link to a thread at Wooden Boat Forum that is good. It contains good info and more links as well. I want to replace my standing rigg by dyneema/dynex. I already contacted Colligo Marine, but there was no feedback. Wich parts of colligo do you use? I want to use the same on my tiki30. Whow long is your mast and how wide is your boat how long are your shrouds? I have a roller jib. So I only want to replace the two wires to the bows under the forstay. How did you fit the colligo-units tu the u-bolts? Can anyone help and give me contact-dates of colligo-marine resellers in Germany or otherwhere in Europe?